T-Bones is one of my favorite meals. Ever. All cuts of beef have always been my favorite, It is the perfect meal for me. 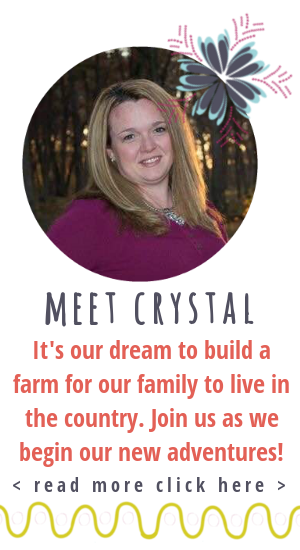 It reminds me of growing up on a cattle farm, dad cooking on the grill, family dinners. 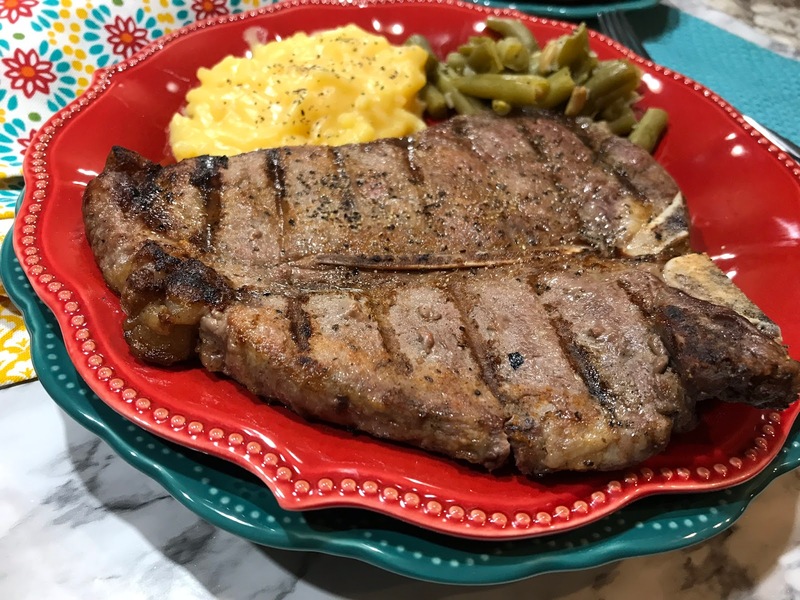 T-Bone Steaks, when grilled correctly, are best off the grill at home. When you can enjoy T-Bone Steaks at home, it always feels like a special meal. This summer when the sweet corn is ready, that is a perfect combination with any cut of meat. Kids won't normally order steaks when they are eating out, but mine will. When we eat steaks at home, table manners are thrown out the window, and you can find my teenage daughter eating steak with her hands. I know I need to work on her manners, or not worry about her going on any dates when she is age - appropriate (we have decided that is 30). 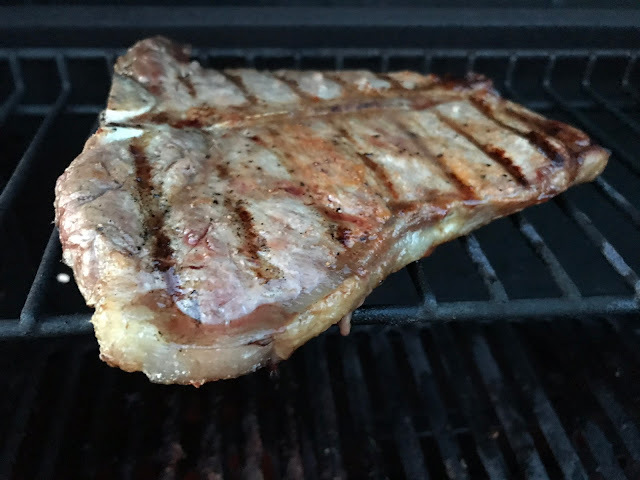 Grilling T-Bone steaks at home can save you money, because it is an expensive cut of meat to begin with. I have seen the prices of T-Bone steaks increase in the past years. Why has the price of meat gone up? There is a very strong demand for beef products. When demand goes up, so does the price. The consumer will see this all trickle down to an increased price at the grocery store. According to USDA, beef demand has gone up 12% from 2016-2017. Not only has the demand in the US gone up, Japan is demanding more of our meat, up 26%. In return, US cattlemen feel the pressure. Beef supplies are increasing, but at a slower pace than the demand. How do I know when the grill is hot? First important thing to do, is to clean your grates, and turn grill on to high heat. Heat the grill to 450-500F. Steaks cook best when you close the lid, and closely watch your steaks. How soon you turn the steaks depends on the thickness and how well you would like them done. 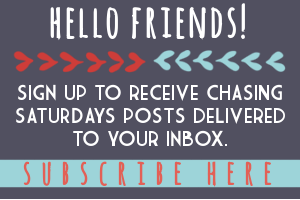 Should I Grill with the Lid Open or Closed?Check out My Fearless Kitchen blog, where she explains if you should grill with the lid open or closed. I prefer to keep the grill lid closed. 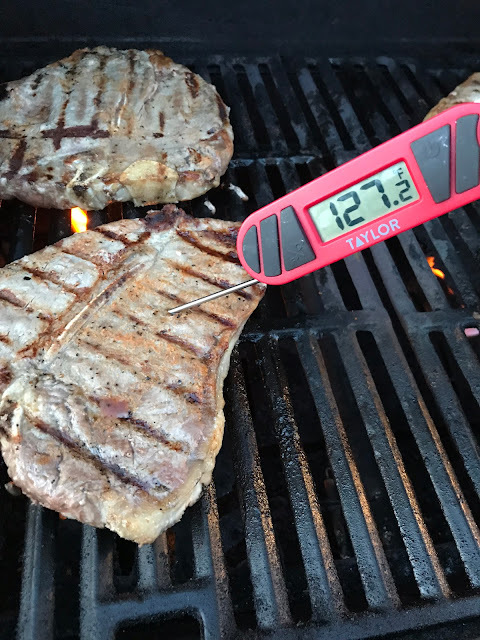 What is the perfect temperature for steaks on the grill? Preheat Grill 450 - 500 degrees. Place your T-Bone steaks on a cookie sheet, and add steak seasonings, salt and pepper to taste. 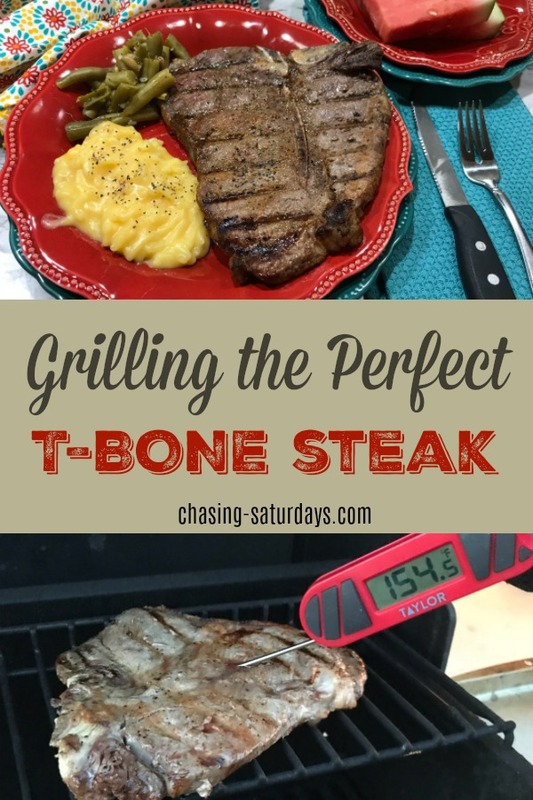 Place T-Bone steak on grill and cook 4-5 minutes per side. Use a digital thermometer to determine internal temperature. Place cooked T-Bone steak on clean platter. Grilling season is the best! Thanks for the helpful tips! I still leave all the grilling to my husband!